Increasingly, patients want to share data from wearables and Bluetooth-connected health devices with their doctors and care teams. Hospitals are experimenting with ways to manage patients between visits using these tools. 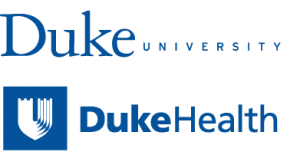 Join Dr. Joy Bhosai, Chief of Digital Health and Strategy at the Duke Clinical Research Institute as she shares insights and experience in collecting and utilizing patient-generated health data for research and clinical care. Register here! Event will be held in the Duke Medical Pavilion room 2W96. Breakfast will be provided.